YSU library has subscribed to the electronic versions of 225 Russian language journals of Russian elibrary.ru scientific network. In addition to those journals, subscription to elibrary.ru will give YSU access to more than 3944 free e-journals. Springer database has a huge electronic library, which includes 2.765 journals, 52.402 E-books and about 28.000 scientific publications. 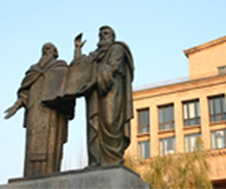 The Armenia VSL provides access to the global research environment in one window principle. The Library includes more than 8.6 million full text research articles and publications from 10,000 journals, and more then 60.000 E-books. YSU research community have access to peer-reviewed articles and databases from the following sources. It's a leading Russian information portal in the field of science, technology, medicine and education, which contains abstracts and full texts of more than 14 million scientific articles and publications. Powered eLIBRARY.RU available electronic versions of over 2200 Russian scientific and technical journals, including more than 1,100 journals in the public domain. Here is the list of available journals from YSU's area. 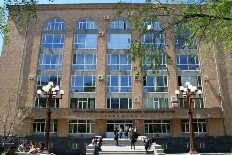 The informational system Math-Net.Ru is the all-Russian mathematical portal providing different resources to Russian and foreign mathematicians in their search of information on mathematical life in Russia. The Directory of Open Access Journals (DOAJ) by the University of Lund, Sweden, containes more then 810.220 full text articles of 7.830 scientific and scholarly journals. It's a fully automated electronic archive and distribution server for scientific communities. Provides full access to 760,362 e-prints in Physics, Mathematics, Computer Science, Quantitative Biology, Quantitative Finance and Statistics. The TIB is the German national library for all areas of engineering, as well as architecture, chemistry, information technology, mathematics and physics. You can search leading specialised databases. Over 160 million data sets are available. The integrated delivery or direct access to full texts, research data, audiovisual media and 3D-models enables fast access to subject and research information. GetInfois a free-of-charge service offered by the TIB which is worldwide the largest specialised library for science and technology. Portal provides necessary information for policy-makers to learn about the global OA environment and to view their country’s status, and understand where and why Open Access has been most successful. Directory of Open Access includes electronic articles in specific subject categories such as: Social Sciences, Medical Sciences, Engineering and Technology, Arts and Humanities. Database with subject heading list: 26 branches /600 sources/ 8 federal disrtricts of RF /235 countries and jurisdictions/ main materials /articles and interviews of 3000 chief executives. A thousand pieces of news daily, full text in Russian, millions of the best stories of news agencies and business press for 15years. Cambridge Core is a brand new platform for Cambridge University Press's academic content. The book and journal content has been brought together for the first time on Cambridge Core: a sophisticated, high-performance replacement for Cambridge Journals Online and Cambridge Books Online.